Activation of peroxisome proliferator–activated receptor-β/δ (PPARβ) lowers blood pressure in genetic and mineralocorticoid-induced hypertension. 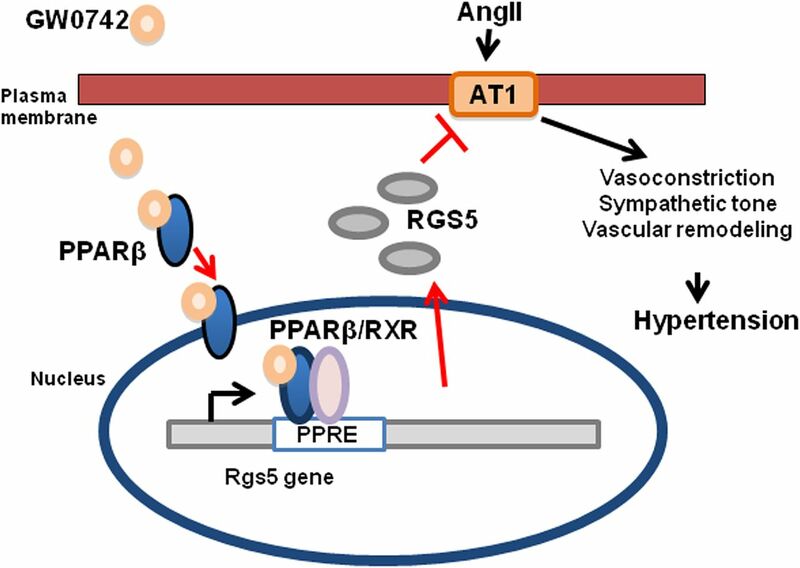 Regulator of G-protein-coupled receptor signaling 5 (RGS5) protein, which interferes in angiotensin II (AngII) signaling, is a target gene to PPARβ. The aim of the present study was to examine whether PPARβ activation in resistance arteries and brain tissues prevents the elevated blood pressure in AngII-induced hypertension and evaluate the role of RGS5 in this effect. C57BL/6J male mice were divided into five groups (control mice, PPARβ agonist [4-[[[2-[3-Fluoro-4-(trifluoromethyl)phenyl]-4-methyl-5-thiazolyl]methyl]thio]-2-methylphenoxy]acetic acid (GW0742)-treated mice AngII-infused mice, GW0742-treated AngII-infused mice, and AngII-infused mice treated with GW0742 plus PPARβ antagonist 3-[[[2-Methoxy-4-(phenylamino)phenyl]amino]sulfonyl]-2-thiophenecarboxylic acid methyl ester (GSK0660)) and were followed for 3 weeks. GW0742 prevented the increase in both arterial blood pressure and plasma noradrenaline levels and the higher reduction of blood pressure after ganglionic blockade, whereas it reduced the mesenteric arterial remodeling and the hyper-responsiveness to vasoconstrictors (AngII and endothelin-1) in AngII-infused mice. These effects were accompanied by an inhibition of NADPH oxidase expression and activity in the brain. Gene expression profiling revealed a marked loss of brainstem and vascular RGS5 in AngII-infused mice, which was restored by GW0742. GW0742-induced effects were abolished by GSK0660. 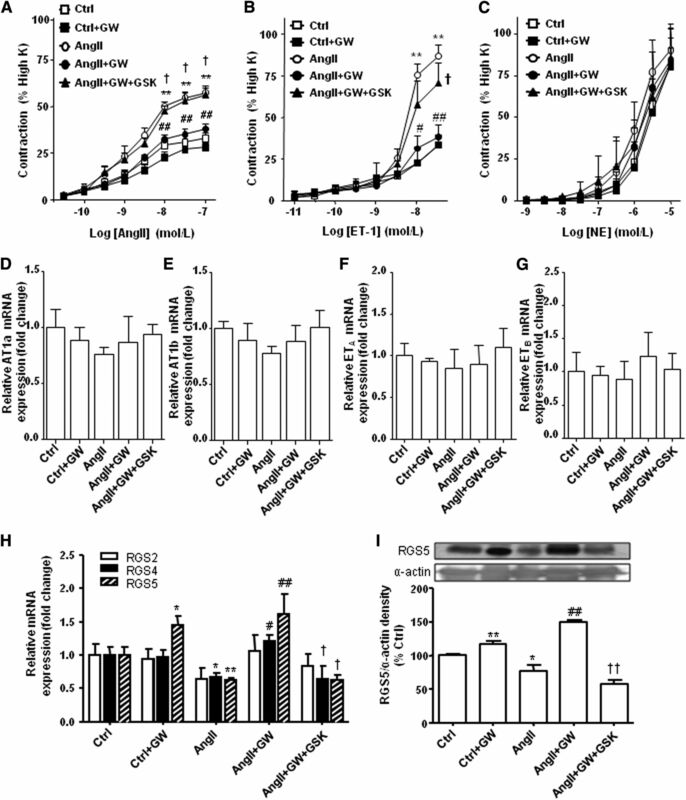 Small interfering RNA targeting RGS5 caused augmented contractile response to AngII in resistance mesenteric arteries and blunted the inhibitory effect of GW0742 on this response. In conclusion, GW0742 exerted antihypertensive effects, restoring sympathetic tone and vascular structure and function in AngII-infused mice by PPARβ activation in brain and vessels inhibiting AngII signaling as a result of RGS5 upregulation. Peroxisome proliferator–activated receptor β/δ (PPARβ) is a ligand-activated transcription factor of the nuclear hormone receptor superfamily. Activation of PPARβ regulates gene expression by forming a heterodimeric complex with the retinoid X receptor, which binds to peroxisome proliferator hormone responsive elements in the promoter region of the target genes to activate/repress transcription (Kota et al., 2005). 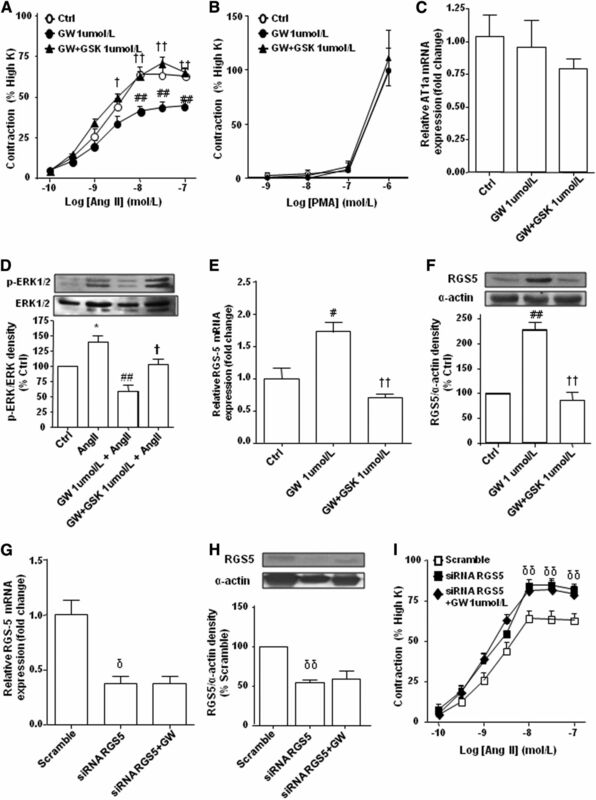 Although the role of PPARβ is well recognized in lipid and glucose metabolism, substantial evidence from both humans and animal models indicates that PPARβ activation exhibits anti-inflammatory and antiatherosclerotic properties by transrepression of proinflammatory and pro-oxidant genes in the vascular system (Rival et al., 2002; Graham et al., 2005; Risérus et al., 2008; Takata et al., 2008). Furthermore, PPARβ may also participate in blood pressure regulation and vascular function. In fact, it has recently described that PPARβ activation reduces blood pressure in both renin-angiotensin system (RAS)–dependent models, such as spontaneously hypertensive rats (Zarzuelo et al., 2011) and gestational hypertensive mice (Holobotovskyy et al., 2015), and RAS-independent hypertensive models, such as mineralocorticoid-induced (Zarzuelo et al., 2013) hypertensive rats. PPARβ activation reduced endothelial dysfunction, hyper-responsiveness to vasoconstrictor [e.g., angiotensin II (AngII), endothelin-1 (ET-1)], and oxidative and proinflammatory status in aorta from hypertensive animals (Zarzuelo et al., 2011; Holobotovskyy et al., 2015), independent of systemic changes in metabolism. However, the effects of PPARβ activation in vascular tone of small arteries, which plays an essential role in control of systemic vascular resistance, remain undefined. It is well established that AngII plays a key role in the pathogenesis of hypertension through vascular remodeling, increased oxidative stress, endothelial dysfunction, enhanced inflammatory response, and increased sympathetic outflow (Kimura et al., 2004; Virdis et al., 2004). Increased RAS activity in the central nervous system contributes to the development and maintenance of hypertension in several experimental models, in which pharmacological or genetic interventions that reduce RAS activity in the brain have been shown to reduce sympathetic activation and attenuate hypertension (Xue et al., 2011; Cardinale et al., 2012). Most of the prohypertensive actions of AngII in the vasculature and brain are mediated via the G-protein-coupled angiotensin II type 1 (AT1) receptors, which are coupled to the Gαq subunit (Ryan et al., 2004; Mehta and Griendling, 2007). NADPH oxidase–derived reactive oxygen species (ROS) are important mediators of AngII signaling (Hanna et al., 2002). In fact, central AngII, via an AT1 receptor mechanism, activates sympathetic outflow by stimulation of NADPH oxidase–dependent ROS production (Gao et al., 2005). Emerging evidence indicates that regulators of G-protein-coupled signaling (RGS) proteins (RGS2, RGS4, and RGS5), acting as GTPase-activating proteins, play important roles in the regulation of the AngII signaling pathway (Manzur and Ganss, 2009; Matsuzaki et al., 2011). For instance, recent data from transgenic and knockout mice show a direct relationship between loss of RGS5 protein expression and hyper-responsiveness to vasoconstrictor response and hypertension induced by AngII (Hercule et al., 2007; Holobotovskyy et al., 2013). There is circumstantial evidence that RGS5 expression in aorta (Takata et al., 2008; Zarzuelo et al., 2011, 2013) and in mesenteric arteries (Ketsawatsomkron et al., 2012) correlates with PPARβ activation, but the role of RGS5 protein in the antihypertensive effects of PPARβ agonists has not been clearly demonstrated. Moreover, both PPARβ and RGS5 protein are expressed in several brain regions associated with cardiovascular and autonomic regulation. However, whether oral administration of PPARβ agonists induces changes in brain AngII-AT1 signaling involving RGS5 protein is unexplored. In this study, we hypothesized that activation of PPARβ would exert antihypertensive effects in an AngII-induced hypertension murine model by interfering with the AngII signaling pathway through upregulation of RGS5 proteins in resistance arteries and brain. Activation of brain PPARβ might also modulate AngII signaling in the brain, thereby reducing sympathetic excitation and blood pressure. Therefore, the aim of the present study was to examine whether chronic treatment with the highly selective PPARβ agonist [4-[[[2-[3-Fluoro-4-(trifluoromethyl)phenyl]-4-methyl-5-thiazolyl]methyl]thio]-2-methylphenoxy]acetic acid (GW0742) prevents an increase in blood pressure, vascular tone, and sympathetic excitation in AngII-induced hypertension, and evaluate the role of RGS5 in the effects of PPARβ activation on G-protein-mediated signaling by AngII. All procedures conform to directive 2010/63/EU for the ethical care of animals and were approved by the Ethics Committee for the welfare of experimental animals at the University of Granada (Granada, Spain; approval no. 459-bis-CEEA-2012). Ten- to 12-week-old C57BL/6J male mice were purchased from Charles River (Barcelona, Spain), and were housed on a 12-hour light/dark cycle and fed a standard chow diet with water ad libitum. In a first set of experiments, mice were trained for systolic blood pressure (SBP) determinations by tail-cuff plethysmography before recording baseline measurements (Toral et al., 2014). In a second set, mice were subjected to isoflurane anesthesia, and a catheter connected to a radiotelemetry device was inserted in the left carotid artery to monitor heart rate and blood pressure by telemetry under conscious, unrestrained conditions using Dataquest A.R.T 4.0 software (Data Sciences International, St. Paul, MN) (Desjardins et al., 2008). After a recovery period of 7 days, long-term (24 hours) online recordings were digitized and stored for further analysis to determine baseline mean arterial pressure (MAP) levels. After baseline determinations, both series of mice were anesthetized with 2% isoflurane inhalation to implant osmotic minipumps (Alzet 2004; Durect Corporation, Cupertino, CA), and AngII was infused at a dose of 400 ng kg−1 min−1 for 3 weeks. Sham-operated animals receiving minipumps with vehicle were used as controls. Animals were randomly divided into five groups (n = 6 and 5 in each group for the first and second sets, respectively): 1) control mice, 2) treated with the PPARβ agonist GW0742 (5 mg kg−1 day−1, mixed in 0.1 ml of methylcellulose by oral gavage), 3) AngII-infused, 4) AngII-infused plus GW0742, and 5) AngII-infused plus GW0742 plus the PPARβ antagonist 3-[[[2-Methoxy-4-(phenylamino)phenyl]amino]sulfonyl]-2-thiophenecarboxylic acid methyl ester (GSK0660) (1 mg kg−1 day−1 by intraperitoneal injection, 0.1 ml). GSK0660 was diluted first in dimethylsulfoxide (DMSO) and later in NaCl 0.9% (DMSO less than 1%). Mice were treated with the corresponding oral and i.p. vehicles of the substances given to the other groups. At the end of the treatment, mice were sacrificed to collect blood and tissue samples for further processing. Morphologic Parameters, Cardiac and Renal Weight Indices, and Histologic Analysis. Body weight of animals was measured at the beginning and end of treatment. The heart and kidneys were excised, cleaned, and weighed. The atria and the right ventricle were then removed, and the remaining left ventricle was weighed. The cardiac, left ventricular, and renal weight indices were calculated by dividing the heart, left ventricle, and kidney weight by the tibia length. A sample of the superior mesenteric artery was obtained from each mouse by dissection, and was immersed in free-calcium Krebs’ solution for 30 minutes and then in 10% formaldehyde. Samples were then dehydrated in graded ethanol solutions and embedded in paraffin. In each artery, a series of four 5-μm cross-sections were made on a precision microtome (Model HM500 OM; Microm International, Walldorf, Germany) and stained with hematoxylin-eosin to highlight structure, picrosirius red to highlight fibrillar collagens, and orcein to highlight elastin. Arterial media thickness, lumen diameter, media cross-sectional area (MCSA), and media-lumen ratio (M/L) were measured, as previously described (Castro et al., 2009), using a computer equipped with a Leica Q500MC image analyzer connected to a video camera of a Leica Leitz DMRB microscope (Leica, Wetzlar, Germany). Second-branch mesenteric artery rings (1.5–2 mm in length) were used to evaluate the response to vasoconstrictor agents in a wire myograph. In this resistance mesenteric artery (RMA), cumulative concentration-response curves for noradrenaline (10−9–10−5 M), ET-1 (10−11–10−6 M), or AngII (10−10–10−7 M) were performed. Contractions were expressed as a percentage of the contraction evoked by high-potassium (80 mM) physiologic saline solution (isotonic replacement of Na+ with K+). To evaluate the role of PPARβ in the contractile response to AngII under in vitro conditions, RMAs isolated from control mice were incubated for 24 hours with vehicle or GW0742 (1 µM), with or without prior (1-hour) incubation with the PPARβ antagonist, GSK0660 (1 µM). Then, RMAs were washed with physiological saline solution and were mounted on a wire myograph to test the contractile response to AngII or phorbol 12-myristate,13-acetate (PMA, 10−9–10−6 M), or were frozen (−80°C) until quantitative reverse-transcriptase polymerase chain reaction (RT-PCR) analysis, or were stimulated for 5 minutes with 0.5 µM AngII and then frozen until extracellular signal-regulated kinase 1/2 (ERK1/2) phosphorylation analysis by western blot. Small Interfering RNA Transfection of Resistance Mesenteric Artery. RMAs were transfected by reverse permeabilization, as previously described (Moreno et al., 2014). After 3 days of transfection, some RMAs were incubated in the presence of vehicle (DMSO < 0.1%) or 1 µM GW0742 for 24 hours before assessing vascular contractility and mRNA or protein expression. A mixture of three small interfering RNAs (siRNAs) targeting different regions of mouse RGS5 was used (TriFECTa kit; IDT Technologies, Coralville, IA). In preliminary studies, siRNA efficiency was measured by RT-PCR, confirming a reduction in RGS5 mRNA levels by 68 ± 18% at 72 hours, as compared with vessels exposed to random siRNA (scramble). The lucigenin-enhanced chemiluminescence assay was used to determine NADPH oxidase activity in the brainstem (Romero et al., 2010). In brief, brain homogenates from all experimental groups were incubated for 30 minutes at 37°C in HEPES-containing physiologic salt solution (pH 7.4). O2− production was stimulated by addition of NADPH (100 μM), and lucigenin was injected automatically at a final concentration of 5 μM. NADPH oxidase activity was determined by measuring luminescence over 200 seconds in a scintillation counter (Lumat LB 9507; Berthold, Bad Wildbad, Germany) in 5-second intervals and was calculated by subtracting the basal values from those in the presence of NADPH. NADPH oxidase activity is expressed as relative luminescence units/min/mg protein in brain tissue. For RT-PCR analysis, total RNA was extracted from the vascular mesenteric bed or brain by homogenization and converted to cDNA by standard methods. Polymerase chain reaction was performed with a Techne Techgene thermocycler (Techne, Cambridge, UK). A quantitative real-time RT-PCR technique was used to analyze mRNA expression. The sequences of the sense and antisense primers used for amplification are described in Supplemental Table 1. Preliminary experiments were carried out with various amounts of cDNA to determine nonsaturating conditions of PCR amplification for all of the genes studied. Therefore, under these conditions, relative quantification of mRNA was assessed by the RT-PCR method (Freeman et al., 1999). Quantification was performed using the ΔΔCt method. The housekeeping genes RPL13 and glyceraldehyde-3-phosphate dehydrogenase (GADPH) were used for internal normalization. RMAs or brain homogenates were run on an SDS–polyacrylamide gel electrophoresis. Proteins were transferred to polyvinylidene difluoride membranes, incubated with primary mouse monoclonal anti-RGS5, rabbit polyclonal anti-PPARβ (Santa Cruz Biotechnology, Santa Cruz, CA), or rabbit polyclonal anti–NOX-1 (Novus Biologicals, Ltd., Cambridge, UK) antibodies overnight and with the corresponding secondary peroxidase-conjugated antibodies. Phosphorylated ERK1/2 and ERK1/2 were detected after the membranes were incubated with the respective primary antibodies: rabbit anti-ERK1/2 (Cell Signaling Technology, Danvers, MA) and mouse anti–phospho-ERK1/2–Thr183 and Tyr185 (Sigma-Aldrich, St. Louis, MO), all at 1:1000 dilution.”. Antibody binding was detected by an ECL system (Amersham Pharmacia Biotech, Amersham, UK), and a densitometric analysis was performed using Scion Image-Release Beta 4.02 software (http://www.scioncorp.com) (Romero et al., 2009). RMAs or brain samples were reprobed for expression of α-actin or GAPPH, respectively. Evaluation of the Contribution of Sympathetic Activity to the Antihypertensive Effect of GW0742 in AngII-Induced Hypertension. Mice were randomly divided into four groups: 1) control mice, 2) AngII-infused, 3) AngII-infused plus GW0742, and 4) AngII-infused plus GW0742 plus the PPARβ antagonist GSK0660. When the experimental period was completed, a polyethylene catheter (PE-50) was inserted into the carotid artery for blood pressure (BP) and heart rate measurements and for extraction of blood samples. Intra-arterial BP was measured at 24 hours after implantation of the catheter. Direct BP was recorded continuously (MacLab; AD Instruments, Hastings, UK). Acute BP responses to intravenous injection of pentolinium (10 mg kg−1) were analyzed in conscious mice. The pentolinium dose was selected because it produces maximal sympathetic inhibition (Pechánová et al., 2004). Decreases in BP were expressed as the percentage of the maximal pentolinium-induced inhibition to minimize the effect of differences in the initial value. Subsequently, blood samples were drawn via the catheter to measure noradrenaline. We used enzyme-linked immunosorbent assay kits (IBL International, Hamburg, Germany) to measure plasma noradrenaline concentrations. Finally, the mice were killed by complete exsanguination, and the brain was removed, snap-frozen in liquid nitrogen, and stored at −80°C until they were processed for the RT-PCR measurement and western blot. Results are expressed as means ± S.E.M. Statistical analyses were performed using GraphPad Prism 5 software (GraphPad Software, La Jolla, CA). A two-factor analysis of variance was used to test for drug or group interactions. When a significant interaction was detected, one-way analysis of variance with a Student-Newman-Keuls post-hoc test was used to discern individual differences between groups. Significance was accepted at P < 0.05. Effects of GW0742 on Blood Pressure, Heart Rate, and Morphologic Variables. AngII-infused mice showed a progressive increase in SBP, measured by tail-cuff plethysmography (Fig. 1A), and MAP, measured by radiotelemetry, as compared with control mice (Fig. 1B). This increase reached approximately 40 and 22 mm Hg at the end of the treatment of SBP and MAP, respectively. Long-term GW0742 administration prevented an increase in both SBP and MAP by approximately 73 and 87%, respectively, in AngII-infused mice (P < 0.01), but had no effect in control animals. The antihypertensive effect of GW0742 was completely abolished by coadministration of the PPARβ antagonist GSK0660, confirming that PPARβs are responsible for the effects of GW0742. On the other hand, no significant differences were observed in heart rate among all experimental groups at the end of the treatment (Fig. 1C). Effects of long-term GW0742 (GW) administration on SBP (A), MAP) (B), and heart rate (HR) (C) as measured by tail-cuff plethysmography (A) and telemetry (B and C) in AngII-induced hypertension. Experimental groups: control mice (Ctrl) (n = 5), GW-treated-mice (Ctrl+GW) (n = 5), AngII-infused mice (AngII) (n = 5), GW-treated AngII-infused-mice (AngII+GW) (n = 5), and AngII-infused mice treated with GW plus GSK0660 (AngII+GW+GSK) (n = 5). Values are expressed as the mean ± S.E.M. *P < 0.05 and **P < 0.01, AngII versus Ctrl group; #P < 0.05 and ##P < 0.01, AngII+GW versus AngII group; †P < 0.05 and ††P < 0.01, AngII+GW+GSK versus AngII+GW group. Body weight increased in both control and AngII-infused mice groups after 3 weeks (3.38 ± 1.3% and 3.41 ± 1.2%, respectively). GW0742 treatment significantly decreased the gain in body weight at the end of treatment in the AngII group (Table 1). This effect seems to be unrelated to changes in food and water intake, which were unaffected by GW0742 (Table 1). Heart weight and left ventricular weight relative to tibia length were higher in AngII-infused group as compared with the control group. GW0742 significantly reduced the AngII-induced cardiac hypertrophy, and this effect was prevented by GSK0660 (Table 1). No significant differences were observed in kidney weight relative to tibia length among all experimental groups. Values are expressed as the mean ± S.E.M. Structural alterations in superior mesenteric arteries characterized by a significant increase in MCSA (≈ 27%) and M/L ratio (≈ 29%) (Fig. 2) were observed in AngII-infused mice as compared with the control group. Treatment with GW0742 significantly reduced all of these structural alterations in the AngII-infused group, and this effect was again abolished by GSK0660, indicating that effects induced by GW0742 in the vasculature were mediated by activation of PPARβ. However, no significant changes were observed among groups in the collagen and elastin content (Supplemental Fig. 1). Effects of chronic GW0742 (GW) treatment on structural modifications induced in superior mesenteric arteries from AngII-infused mice. (A) Representative histologic sections of paraffin-embedded tissues stained with hematoxylin-eosin. Morphometric analysis of cross-sectional area (MCSA) (B) and M/L (C). Experimental groups: control mice (Ctrl), GW-treated mice (Ctrl+GW), AngII-infused mice (AngII), GW-treated AngII-infused mice (AngII+GW), and AngII-infused mice treated with GW plus GSK0660 (AngII+GW+GSK). Values are expressed as the mean ± S.E.M. of n = 4–6. *P < 0.05, AngII versus Ctrl group; #P < 0.05, AngII+GW versus AngII group; †P < 0.05, AngII+GW+GSK versus AngII+GW group. GW0742 Improves Vascular Dysfunction Induced by AngII by Upregulation of RGS5. The gene expression of PPARβ was similar in RMAs from all experimental groups (not shown). Increased contractile responses to AngII (Fig. 3A) and ET-1 (Fig. 3B), without changes to noradrenaline (Fig. 3C), were obtained in RMAs from AngII-infused mice. Chronic GW0742 treatment restored contractions induced by AngII and ET-1 to a level similar to that found in control mice. These inhibitory effects induced by GW0742 were suppressed by GSK0660. No significant changes in the expression of AT1a (Fig. 3D), AT1b (Fig. 3E), ETA (Fig. 3F), and ETB (Fig. 3G) receptors in RMAs were observed after AngII infusion. To determine whether PPARβ activation regulates components of AngII receptor signaling, we examined the effects of GW0742 on expression of the key regulators of G-protein-coupled signaling: RGS2, RGS4, and RGS5. The mesenteric vascular bed from AngII-infused mice showed a reduced expression of RGS4 (Fig. 3H) and RGS5 (Fig. 3, H and I) as compared with the control mice, which were without effect in RGS2 (Fig. 3H). GW0742 treatment increased significantly the RGS4 and RGS5 expression in the AngII-infused mice, whereas PPARβ blockade by GSK0660 abolished the effects induced by GW0742 (Fig. 3, H and I). Of note, only RGS5 expression was increased after GW0742 treatment of control mice. Effects of chronic GW0742 (GW) on vascular dysfunction induced by AngII and on RGS expression. Contractile response curve for AngII (A), ET-1 (B), and noradrenaline (NE) (C) in RMAs from AngII-infused mice. Data are expressed as the percentage of maximal contraction to 80 mM KCl. RMA mRNA levels of AT1a (D), AT1b (E), ETA (F), and ETB (G) receptors; RGS2, RGS4, and RGS5 (H); and RGS5 protein expression (I) in AngII-infused mice. Values are expressed as the mean ± S.E.M. from four to five separate experiments. Experimental groups: control mice (Ctrl), GW-treated mice (Ctrl+GW), AngII-infused mice (AngII), GW-treated AngII-infused mice (AngII+GW), and AngII-infused mice treated with GW plus GSK0660 (AngII+GW+GSK). *P < 0.05 and **P < 0.01, AngII versus Ctrl group; #P < 0.05 and ##P < 0.01, AngII+GW versus AngII group; †P < 0.05, AngII+GW+GSK versus AngII+GW group. Furthermore, to analyze the mechanisms of PPARβ activation on vascular tone, a series of experiments were carried out in control RMAs incubated in vitro with GW0742 (1 µM) for 24 hours. Reduced contraction response to AngII in RMA was observed after incubation with GW0742 (Fig. 4A), which was prevented by PPARβ blockade. In contrast, no significant changes in either the contractile responses induced by PMA (Fig. 4B) or the AT1a mRNA levels (Fig. 4C) were observed in RMA incubated with vehicle or GW0742. In addition, GW0742 incubation also abolished the increase in ERK1/2 phosphorylation induced by 5-minute exposure to AngII (0.5 µM) in RMA, which was also abolished by GSK0660 (Fig. 4D). In accordance with the in vivo results, the effects of GW0742 were accompanied by upregulation of RGS5 and abolished by GSK0660 (Fig. 4, E and F). To verify the role of RGS5 on the effects mediated by PPARβ activation, RMAs were transfected with siRNA targeting RGS5. After transfection, siRNA efficiency was measured by RT-PCR, confirming a reduction in RGS5 mRNA levels by 63 ± 7% at 72 hours as compared with vessels exposed to random siRNA (scramble) (Fig. 4G), and similarly by western blot (Fig. 4H). However, no significant changes in RGS2 (Supplemental Fig. 2A) or RGS4 (Supplemental Fig. 2B) mRNA levels were observed among groups after transfection, confirming the specificity of the transfection. The contractile response to KCl (80 mM) in scamble and siRNA vessels was similar to that found in freshly harvested vessels (Supplemental Fig. 3A), showing the functionality of this preparation after 4 days of incubation. In RGS5 siRNA-transfected vessels, an increased contraction to AngII was observed (P < 0.01 vs. scramble transfection), and in these vessels, incubation with GW0742 was unable to increase RGS5 mRNA and protein expression and to reduce AngII contractions (Fig. 4, G–I). Furthermore, AT1a (Supplemental Fig. 3B) and PPARβ (Supplemental Fig. 3C) mRNA levels were similar in RGS5 siRNA-transfected vessels compared to scramble transfection, and were unaffected by GW0742. Role of RGS5 in in vitro vascular effects of GW0742 (GW). In vitro effects of GW on the contractile response curve for AngII (A and I) and PMA (B), ERK1/2 phosphorylation (p-ERK1/2) induced by AngII (0.5 μM, 5 minutes) (D), and the mRNA level of AT1a (C) and RGS5 (E and G) by RT-PCR and RGS5 protein expression (F and H) in RMA. Vessels were incubated in the presence or absence of GW (1 µM) and GW+GSK0660 (GSK; 1 µM) for 24 hours (A–F), or were transfected with siRNA targeting RGS5 (G–I). Data are presented as a percentage of maximal contraction to 80 mM KCl or as a ratio of arbitrary units of mRNA (2-ΔΔCt) or RGS5/α-actin. Results are shown as the mean ± S.E.M., derived from four to five separate rings. *P < 0.05, AngII versus control (Ctrl) group; #P < 0.05 and ##P < 0.01, as compared with control condition; †P < 0.05 and ††P < 0.01, as compared with GW; δP < 0.05 and δδP < 0.01, as compared with scramble group. GW0742 Reduces the Increase in Sympathetic Activity Induced by AngII. In conscious mice, ganglionic blockade with pentolinium produced a greater percentage decrease in MAP in AngII-infused mice than in controls (Fig. 5A). In addition, plasma noradrenaline, a marker of sympathetic nerve activity, was also higher in AngII-infused mice than in controls (Fig. 5B). PPARβ activation prevented the changes induced by AngII in both the response to ganglionic blockade and plasma noradrenaline. Effects of GW0742 (GW) on sympathetic tone and brainstem PPARs expression. (A) Percentage decrease induced by acute intravenous administration of pentolinium (10 mg kg−1) on MAP in conscious mice. (B) Plasma noradrenaline levels. mRNA levels of PPARα (C), PPARγ (D), and PPARβ (E) and PPARβ protein expression (F) in the brainstem. Values are expressed as the mean ± S.E.M. from five to nine separate experiments. Experimental groups: control mice (Ctrl), AngII-infused mice (AngII), GW-treated AngII-infused mice (AngII+GW), and AngII-infused mice treated with GW plus GSK0660 (AngII+GW+GSK). Expression data are presented as a ratio of arbitrary units of mRNA (2-ΔΔCt) compared with the mice control group. *P < 0.05, AngII versus Ctrl group; #P < 0.05 and ##P < 0.01, AngII+GW versus AngII group; †P < 0.05, AngII+GW+GSK versus AngII+GW group. GW0742 Reduces NADPH Oxidase Activity and Increases RGS5 Expression in Brainstem from AngII-Infused Mice. The gene expression of PPARα (Fig. 5C), PPARγ (Fig. 5D), and PPARβ (Fig. 5E and F) was similar in the brainstem from all experimental groups. NADPH oxidase activity was also increased in the brainstem from AngII-infused mice when compared with control mice (Fig. 6A). No significant mRNA changes in NADPH oxidase subunits NOX-4 (Fig. 6B), p47phox (Fig. 6C), and p22phox (Fig. 6D) were observed in brain tissue from AngII-infused mice when compared with control mice. However, upregulation of gene (Fig. 6E) and protein (Fig. 6F) expression of NOX-1 was induced by AngII infusion. Chronic oral treatment with GW0742 significantly reduced both NADPH oxidase activity and gene upregulation of NOX-1. Effects of long-term GW0742 (GW) administration on NADPH oxidase pathway in the brainstem. NADPH oxidase activity measured by lucigenin-enhanced chemiluminescence (A) and expression of NADPH oxidase subunits NOX-4 (B), p47phox (C), p22phox (D), and NOX-1 (E) at the level of mRNA in the brain by RT-PCR, and NOX-1 protein (F) by western blots. Data are presented as a ratio of arbitrary units of mRNA (2-ΔΔCt) or NOX-1/GADPH compared with the mice control group. Values are expressed as the mean ± S.E.M. from separate mice (n = 4–6). Experimental groups: control mice (Ctrl), AngII-infused mice (AngII), GW treated AngII-infused mice (AngII+GW), and AngII-infused mice treated with GW plus GSK0660 (AngII+GW+GSK). *P < 0.05 and **P < 0.01, AngII versus Ctrl group; #P < 0.05 and ##P < 0.01, AngII+GW versus AngII group; †P < 0.05 and ††P < 0.01, AngII+GW+GSK versus AngII+GW group. RLU, relative luminescence units. AngII-infusion also increased the mRNA levels of AT1a receptor in the brain (Fig. 7A), which was inhibited after PPARβ activation by GW0742. Brainstem homogenates from AngII-infused mice showed lower mRNA (Fig. 7B) and protein levels of RGS5 (Fig. 7C) than controls. GW0742 treatment also increased the gene and protein expression of RGS5. All of these brain changes induced by GW0742 were prevented by PPARβ blockade. Effects of long-term GW0742 (GW) administration on AT1 receptor and RGS5 expression in the brainstem. AT1a (A), RGS5 mRNA levels (B), and RGS5 protein expression (C). Data are presented as a ratio of arbitrary units of mRNA (2-ΔΔCt) or RGS5/GADPH compared with mice control group. Values are expressed as the mean ± S.E.M. from separate mice (n = 4–6). Experimental groups: control mice (Ctrl), AngII-infused mice (AngII), GW-treated AngII-infused mice (AngII+GW), and AngII-infused mice treated with GW plus GSK0660 (AngII+GW+GSK). *P < 0.05, AngII versus Ctrl group; #P < 0.05 and ##P < 0.01, AngII+GW versus AngII group; †P < 0.05 AngII+GW+GSK versus AngII+GW group. AngII is a pivotal physiologic regulator of vascular tone, blood pressure, and volume homeostasis. It is well established that chronic AngII infusion induces the development of hypertension, which is characterized by increased SBP, cardiac hypertrophy, vascular remodeling of small resistance arteries, altered vascular function, and sympathetic outflow (Mollnau et al., 2002; Wang et al., 2006; Murdoch et al., 2011). 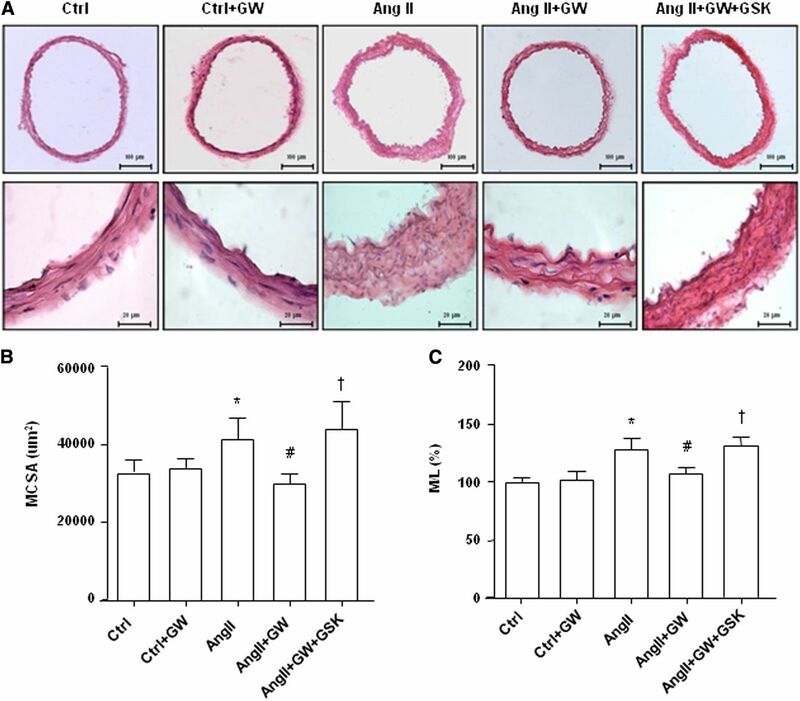 The major findings of this study are as follows: (1) chronic oral administration of GW0742 was able to restore blood pressure in AngII-infused mice without an effect on heart rate; (2) PPARβ activation improved hyper-responses to AngII and ET-1 in RMA induced by AngII; (3) oral GW0742 treatment activated PPARβ in the brain and ameliorated AngII-induced RAS activity, oxidative stress, and sympathetic nerve activity; and (4) upregulation of RGS5 by PPARβ activation interferes with AngII signaling in resistance vessels and brain tissues. (Fig. 8). Schematic summary of the PPARβ-RGS5-AngII signaling in mesenteric arteries and brainstem. PPRE, Peroxisome Proliferator Response Element; RXR, Retinoid X receptor. Our findings are in agreement with and extend recent data from our group in two different models of hypertension in rats (Zarzuelo et al., 2011, 2013) and mice (Holobotovskyy et al., 2015). In addition, similar results have been previously described for the PPARα and PPARγ agonists (Diep et al., 2002a,b; De Ciuceis et al., 2007; Holobotovskyy et al., 2015; Yu et al., 2015). Moreover, AngII infusion induced cardiac and vascular hypertrophy of mesenteric arteries as demonstrated by increased heart/tibia length and M/L ratios and MCSA, respectively. GW0742 completely prevented cardiac hypertrophy and vascular remodeling of mesenteric vessels. In agreement with Wang et al. (2006), increased vasoconstrictor response to AngII and ET-1, without changes in the contractile response to noradrenaline, was found in RMAs from AngII-infused mice. Again, GW0742 reduced the increased contractions induced by both agents. Interestingly, all of these structural and functional effects in resistance arteries induced by GW0742 seemed to be dependent on PPARβ activation, because they were abolished by the PPARβ antagonist GSK0660. The effects of AngII in the vasculature are widely considered to result from AT1 receptor activation. This receptor is expressed as two structurally similar subtypes in rodents, termed AT1a and AT1b (Burson et al., 1994; Hein, 1998). In our study, and in agreement with previous results (Ryan et al., 2004), changes in the expression of AT1a and AT1b receptors in RMA were not observed after AngII infusion. 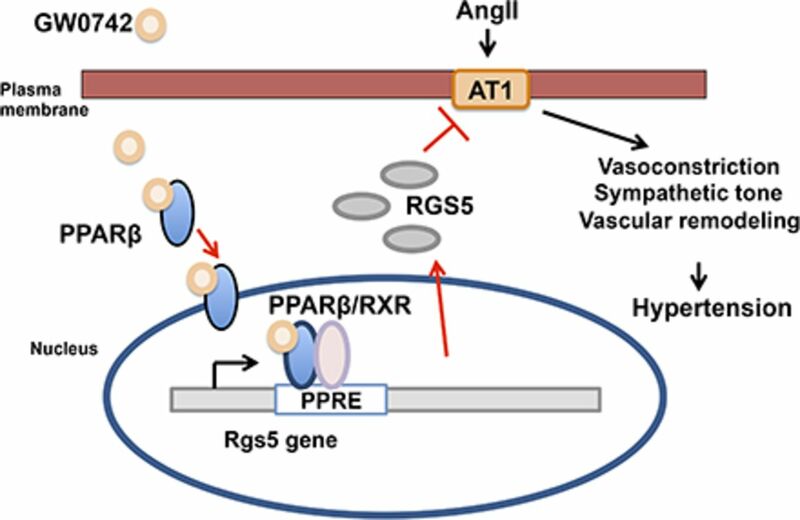 Emerging evidence indicates that the signaling pathway induced by AngII through the AT1 receptor in the cardiovascular system is regulated by RGS proteins (Manzur and Ganss, 2009; Matsuzaki et al., 2011). RGS proteins regulate G-protein-coupled receptor signaling by binding to the active G subunits and stimulating GTP hydrolysis, thus interfering with G-protein signaling (Bansal et al., 2007). RGS5 appears to be the major RGS form present in the vasculature and typically marks smooth muscle cells and pericytes (Bondjers et al., 2003). Interestingly, we found that RGS5 mRNA and protein expression in RMA was increased in control mice treated chronically with GW0742, without affecting mRNA levels of RGS2 and RGS4. This expressional change in RGS5 in RMA induced by chronic GW0742 treatment is in accordance with the increased RGS5 expression in mesenteric artery–induced activation of PPARβ in vitro (present results; Ketsawatsomkron et al., 2012). Here, we found that chronic AngII infusion induced a downregulation in the expression of RGS5 in the vascular mesenteric bed from AngII-infused mice, suggesting that AngII can enhance its own signaling by downregulating its negative modulator RGS5. Moreover, chronic administration of GW0742 prevented this effect via PPARβ activation. Similarly, Takata et al. (2008) also demonstrated that activation of PPARβ inhibited the downregulation in the aortic expression of RGS5 induced by AngII and related their findings with an atheroprotective effect, but without altering blood pressure. However, these experiments were performed in a model of AngII-accelerated atherosclerosis using Low density lipoprotein receptor deficient (LDLR -/-) mice and infusing higher concentrations of AngII than those used in our study. Here, we used a model of AngII slow pressor response, which is considered as a model of essential hypertension in which both AT1 and oxidative stress have been implicated. In addition, the model of AngII slow pressor response is a more useful and straightforward model for the investigation of AngII actions (Kawada et al., 2002; Virdis et al., 2004; Gonzalez-Villalobos et al., 2009). AT1 receptor signaling is negatively regulated by RGS5 (Wang et al., 2002; Cho et al., 2003). In fact, downregulation of RGS5 was accompanied by both an increase in AngII-induced constriction and enhancement of myogenic tone in mouse mesenteric artery (Ketsawatsomkron et al., 2012). Similarly, RGS5 overexpression induced by PPARβ activation in the aorta inhibits contractions via Gqα (Wang et al., 2008; Zarzuelo et al., 2011). Moreover, very recently, RGS5 has been identified as a critical modulator of blood pressure and vascular tone, regulating AngII receptor signaling and downstream pathways (Holobotovskyy et al., 2013). In pregnant RGS5-deficient mice, reduced vascular RGS5 expression causes gestational hypertension by enhancing sensitivity to AngII in uterine arteries (Holobotovskyy et al., 2015). All of these data suggest that upregulation of RGS5 may be an essential step in the antihypertensive effects of GW0742 described herein. To verify this hypothesis, in another series of in vitro experiments, we analyzed whether inhibition of RGS5 affects vascular tone induced by AngII and, specifically, whether it modulates the effects of PPARβ activation. Consistent with the in vivo study, we found that long-term in vitro incubation of isolated RMA with GW0742 reduced the vasoconstriction induced by AngII and upregulated RGS5 in a PPARβ-dependent manner, without affecting AT1a receptor expression. In addition, ERK1/2 phosphorylation induced by AngII was also suppressed by PPARβ activation. Protein kinase C (PKC) is involved in the signaling pathway of AngII. However, after chronic GW0742, no significant changes were observed in the contractions induced by activation of PKC with PMA, showing that PPARβ activation disrupts AngII signaling upstream of PKC. Interestingly, RGS5 gene silencing, which did not alter either AT1a and PPARβ mRNA levels, induced a significant increase in the contractile responses to AngII and abolished the effects of GW0742, confirming the hypothesis of the fundamental role of RGS5 in the effects of PPARβ activation. Nonetheless, there are no direct evidences to asseverate that RGS5 plays a role in antihypertensive effects of PPARβ activation, in contrast to the PPARγ agonist troglitazone, the antihypertensive effect of which was abolished in homozygote RGS5-deficient mice throughout pregnancy (Holobotovskyy et al., 2015). There is a large body of evidence suggesting the central effects of AngII mediate the increase in blood pressure in this model through increases in sympathetic nerve activity, in addition to the prominent peripherally activated noradrenaline release induced by AngII. In fact, we found that AngII-infused mice showed a greater percentage of MAP decrease after acute ganglionic blockade with pentolinium and higher plasma levels of noradrenaline than controls, suggesting that AngII produces central and peripheral activation of sympathetic tone that elevates resting BP in AngII-infused mice. In brain, via an AT1 receptor mechanism, AngII activates sympathetic outflow by stimulation of NADPH oxidase–dependent ROS production (Gao et al., 2005). We also found increased NADPH oxidase activity in brains from AngII-infused mice associated with increased expression of NOX-1, without changes in NOX-4, p47phox, and p22phox. PPARs are expressed in key brain areas involved in cardiovascular regulation. In the brainstem, PPARβ mRNA levels were not affected by either AngII infusion or GW0742 treatment. In addition, oral GW0742 normalized both the greater decrease of MAP induced by pentolinium, possibly as a result of a central action, and the greater noradrenaline plasma levels in AngII-infused mice, involving central and peripheral inhibition of AngII signaling, showing reduced sympathetic excitation. Increased expression of AT1 receptor in the brainstem was also detected after AngII infusion. Several studies showed that the rostral ventrolateral medulla contains high concentrations of AT1 receptors (Head, 1996) and is a major site of the sympathoexcitatory action of central AngII. AT1 receptor expression was upregulated by AngII in this area and in the subfornical organ, the paraventricular hypothalamic nuclei, and the solitary tract nuclei (Yoshimura et al., 2000; Yu et al., 2015). Thus, elevated central AngII may act to upreglulate AT1 receptors in the brainstem. This, in turn, may increase sympathetic outflow via stimulation of NADPH oxidase–derived ROS. GW0742 has the ability to cross the blood-brain barrier, exerting central effects, such as decreasing cognitive impairment in a rat model of Parkinson’s disease (Das et al., 2014), or exerting neuroprotection in a transgenic mouse model of Alzheimer’s disease (Malm et al., 2015). In addition, PPARβ activation reduced the upregulation of AT1 receptor and NADPH oxidase activity, which may play a role in the central regulation of sympathetic outflow. How PPARβ activation reduces AT1 expression remains unknown. Several reports have demonstrated that AngII in the rostral ventrolateral medulla induced long-term pressor actions via upregulation of the AT1 receptor gene in a series of molecular events involving O2− production from NADPH oxidase after AT1 receptor activation (Chan et al., 2007; Liu et al., 2008). 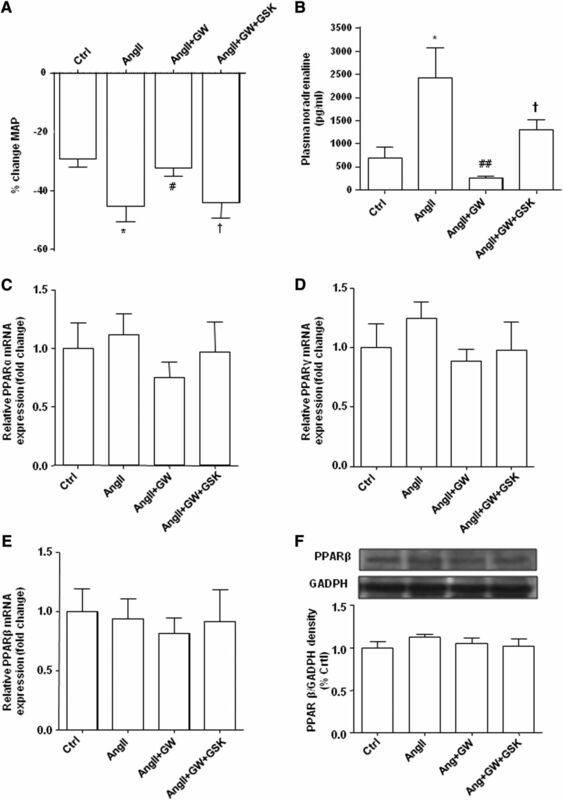 We found that chronic activation of PPARβ increased RGS5 expression, which also interfered with the AngII-AT1 signaling pathway in the brain, reducing NADPH oxidase activity and the subsequent AT1 receptor overexpression, suggesting an important role of brainstem RGS5 in the antihypertensive effects of oral GW0742 in AngII-induced hypertension. Our study is the first to demonstrate that AngII induces brainstem RGS5 downregulation, which would be involved in the increased sympathetic tone. However, taking into account that certain nuclei in the brainstem have been involved in AngII-induced sympathetic activity, it would be interesting to investigate whether RGS5 in those brain regions contributes, at least in part, to the regulation of systemic blood pressure. In addition, the present study did not identify the specific cellular target of the PPARβ agonist in the brain. Within the central nervous system, PPARβ is known to be expressed by oligodendrocytes and neurons (Woods et al., 2003; Hall et al., 2008), and one may speculate that the observed effects represent a collective response. In conclusion, our study is the first to demonstrate that chronic treatment with the highly selective PPARβ agonist GW0742 prevents the increase in blood pressure, sympathetic outflow, mesenteric vascular hypertrophy, and hyper-response to vasoconstrictors in AngII-induced hypertension. These effects seem to be related to a direct activation of PPARβ in the brain, reducing sympathetic nerve activity, and in the vascular wall. 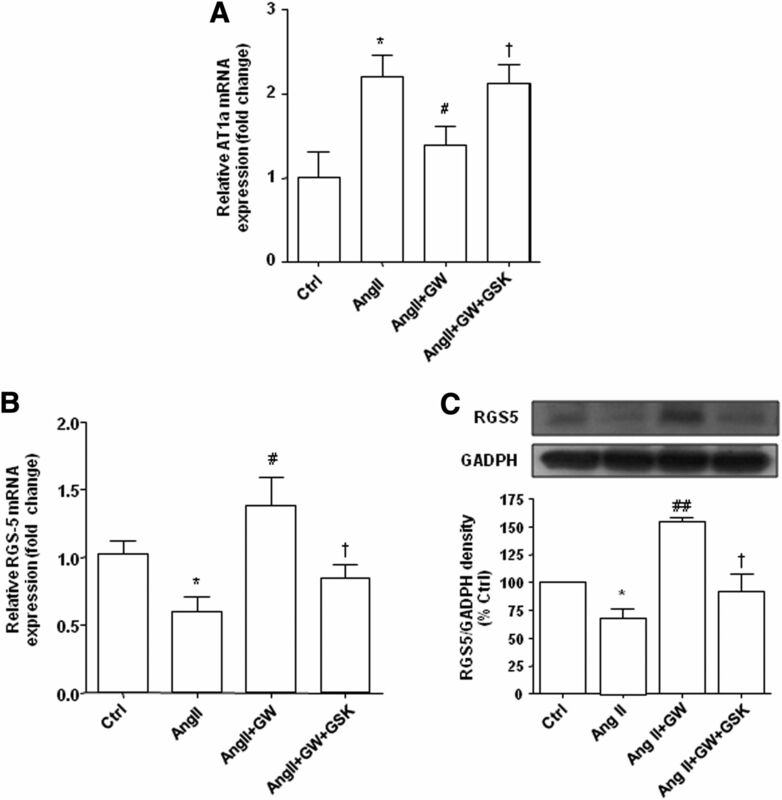 Increased RGS5 expression might play a main role in the antihypertensive effects of PPARβ activation through a negative modulation of the brain and vascular mesenteric actions of AngII (Fig. 8). To our knowledge, this is the first report suggesting that PPARβ in the brain plays a role in the control of BP. Participated in research design: Romero, Tamargo, Pérez-Vizcaíno, Dessy, Duarte. Conducted experiments: Romero, Jiménez, Toral, León-Gómez, Gómez-Gúzman, Sánchez, Zarzuelo, Rodríguez-Gómez, Rath. Performed data analysis: Romero, Jiménez, Tamargo, Pérez-Vizcaíno, Dessy, Duarte. Wrote or contributed to the writing of the manuscript: Romero, Tamargo, Pérez-Vizcaíno, Dessy, Duarte. This work was supported by the Comisión Interministerial de Ciencia y Tecnología and Fondo Europeo de Desarrollo Regional [Grants SAF2010-22066-C02-01, SAF2011-28150, and SAF2014-55523-R]; Junta de Andalucía [Proyecto de excelencia, Grant P12-CTS-2722] with funds from the European Union; Ministerio de Ciencia e Innovación, Campus de Excelencia Internacional (Programa GREIB); and Ministerio de Economía y Competitividad, Instituto de Salud Carlos III, Spain [Grants Red HERACLES RD06/0009 and RIC RD12/0042/0011]. C.D. is an Fonds National de la Recherche Scientifique (FNRS) FNRS senior research associate. (2007) R4 RGS proteins: regulation of G-protein signaling and beyond. Pharmacol Ther 116:473–495. (2003) Transcription profiling of platelet-derived growth factor-B-deficient mouse embryos identifies RGS5 as a novel marker for pericytes and vascular smooth muscle cells. Am J Pathol 162:721–729. (1994) Differential expression of angiotensin receptor 1A and 1B in mouse. Am J Physiol 267:E260–E267. (2012) Angiotensin II-induced hypertension is modulated by nuclear factor-κBin the paraventricular nucleus. Hypertension 59:113–121. (2009) Antioxidant treatment reduces matrix metalloproteinase-2-induced vascular changes in renovascular hypertension. Free Radic Biol Med 46:1298–1307. (2007) Upregulation of AT1 receptor gene on activation of protein kinase Cbeta/nicotinamide adenine dinucleotide diphosphate oxidase/ERK1/2/c-fos signaling cascade mediates long-term pressor effect of angiotensin II in rostral ventrolateral medulla. J Hypertens 25:1845–1861. (2003) The aorta and heart differentially express RGS (regulators of G-protein signalling) proteins that selectively regulate sphingosine 1-phosphate, angiotensin II and endothelin-1 signalling. Biochem J 371:973–980. 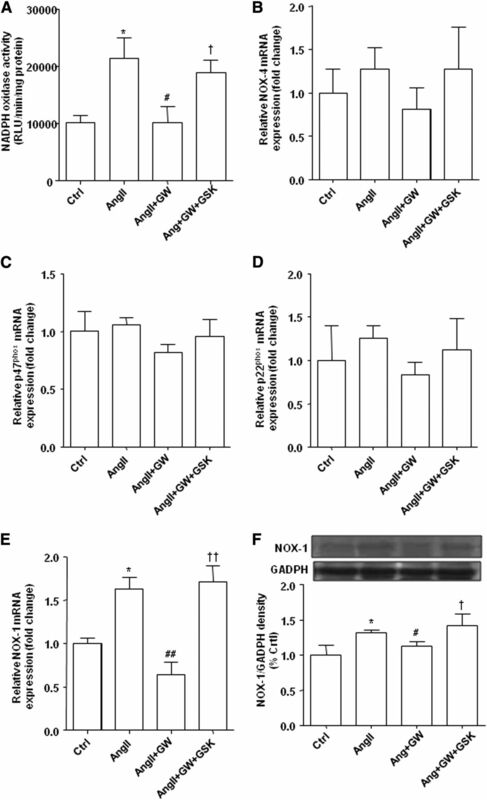 (2014) A PPAR-β/δ agonist is neuroprotective and decreases cognitive impairment in a rodent model of Parkinson’s disease. Curr Neurovasc Res 11:114–124. (2007) Synergistic vascular protective effects of combined low doses of PPARalpha and PPARgamma activators in angiotensin II-induced hypertension in rats. Br J Pharmacol 151:45–53. (2008) Control of blood pressure variability in caveolin-1-deficient mice: role of nitric oxide identified in vivo through spectral analysis. Cardiovasc Res 79:527–536. (2002a) PPARalpha activator effects on Ang II-induced vascular oxidative stress and inflammation. Hypertension 40:866–871. (2002b) Structure, endothelial function, cell growth, and inflammation in blood vessels of angiotensin II-infused rats: role of peroxisome proliferator-activated receptor-gamma. Circulation 105:2296–2302. (1999) Quantitative RT-PCR: pitfalls and potential. Biotechniques 26:112–122, 124–125. (2005) Sympathoexcitation by central ANG II: roles for AT1 receptor upregulation and NAD(P)H oxidase in RVLM. Am J Physiol Heart Circ Physiol 288:H2271–H2279. (2009) Angiotensin-converting enzyme-derived angiotensin II formation during angiotensin II-induced hypertension. Hypertension 53:351–355. (2005) The PPARdelta agonist GW0742X reduces atherosclerosis in LDLR(-/-) mice. Atherosclerosis 181:29–37. (2008) Peroxisome proliferator-activated receptor beta/delta in the brain: facts and hypothesis. PPAR Res 2008:780452. (2002) NAD(P)H oxidase-derived reactive oxygen species as mediators of angiotensin II signaling. Antioxid Redox Signal 4:899–914. (1996) Role of AT1 receptors in the central control of sympathetic vasomotor function. Clin Exp Pharmacol Physiol 23 (Suppl 3):S93–S98. (1998) Genetic deletion and overexpression of angiotensin II receptors. J Mol Med (Berl) 76:756–763. (2007) Regulator of G protein signalling 2 ameliorates angiotensin II-induced hypertension in mice. Exp Physiol 92:1014–1022. (2015) Regulator of G protein signaling 5 is a determinant of gestational hypertension and preeclampsia. Sci Transl Med 7:290ra88. (2013) Regulator of G-protein signaling 5 controls blood pressure homeostasis and vessel wall remodeling. Circ Res 112:781–791. (2002) A mouse model of angiotensin II slow pressor response: role of oxidative stress. J Am Soc Nephrol 13:2860–2868. (2012) PPARγ regulates resistance vessel tone through a mechanism involving RGS5-mediated control of protein kinase C and BKCa channel activity. Circ Res 111:1446–1458. (2004) Malfunction of vascular control in lifestyle-related diseases: oxidative stress of angiotensin II-induced hypertension: mitogen-activated protein kinases and blood pressure regulation. J Pharmacol Sci 96:406–410. (2005) An overview on biological mechanisms of PPARs. Pharmacol Res 51:85–94. (2008) Role of oxidant stress on AT1 receptor expression in neurons of rabbits with heart failure and in cultured neurons. Circ Res 103:186–193. (2015) Activation of the nuclear receptor PPARδ is neuroprotective in a transgenic mouse model of Alzheimer’s disease through inhibition of inflammation. J Neuroinflammation 12:7. (2009) Regulator of G protein signaling 5: a new player in vascular remodeling. Trends Cardiovasc Med 19:26–30. (2011) Potent and selective inhibition of angiotensin AT1 receptor signaling by RGS2: roles of its N-terminal domain. Cell Signal 23:1041–1049. (2007) Angiotensin II cell signaling: physiological and pathological effects in the cardiovascular system. Am J Physiol Cell Physiol 292:C82–C97. (2002) Effects of angiotensin II infusion on the expression and function of NAD(P)H oxidase and components of nitric oxide/cGMP signaling. Circ Res 90:E58–E65. (2014) Ceramide mediates acute oxygen sensing in vascular tissues. Antioxid Redox Signal 20:1–14. (2011) Role of endothelial Nox2 NADPH oxidase in angiotensin II-induced hypertension and vasomotor dysfunction. Basic Res Cardiol 106:527–538. (2004) Vasoactive systems in L-NAME hypertension: the role of inducible nitric oxide synthase. J Hypertens 22:167–173. (2008) Activation of peroxisome proliferator-activated receptor (PPAR)delta promotes reversal of multiple metabolic abnormalities, reduces oxidative stress, and increases fatty acid oxidation in moderately obese men. Diabetes 57:332–339. (2002) PPARalpha and PPARdelta activators inhibit cytokine-induced nuclear translocation of NF-kappaB and expression of VCAM-1 in EAhy926 endothelial cells. Eur J Pharmacol 435:143–151. (2010) Vascular superoxide production by endothelin-1 requires Src non-receptor protein tyrosine kinase and MAPK activation. Atherosclerosis 212:78–85. (2009) Quercetin inhibits vascular superoxide production induced by endothelin-1: Role of NADPH oxidase, uncoupled eNOS and PKC. Atherosclerosis 202:58–67. (2004) Angiotensin II-induced vascular dysfunction is mediated by the AT1A receptor in mice. Hypertension 43:1074–1079. (2008) PPARdelta-mediated antiinflammatory mechanisms inhibit angiotensin II-accelerated atherosclerosis. Proc Natl Acad Sci USA 105:4277–4282. (2014) The probiotic Lactobacillus coryniformis CECT5711 reduces the vascular pro-oxidant and pro-inflammatory status in obese mice. Clin Sci (Lond) 127:33–45. (2004) Role of NAD(P)H oxidase on vascular alterations in angiotensin II-infused mice. J Hypertens 22:535–542. (2006) Angiotensin II infusion alters vascular function in mouse resistance vessels: roles of O and endothelium. J Vasc Res 43:109–119. (2002) Receptor-selective effects of endogenous RGS3 and RGS5 to regulate mitogen-activated protein kinase activation in rat vascular smooth muscle cells. J Biol Chem 277:24949–24958. (2008) RGS5, RGS4, and RGS2 expression and aortic contractibility are dynamically co-regulated during aortic banding-induced hypertrophy. J Mol Cell Cardiol 44:539–550. (2003) Localization of PPARdelta in murine central nervous system: expression in oligodendrocytes and neurons. Brain Res 975:10–21. (2011) Central interactions of aldosterone and angiotensin II in aldosterone- and angiotensin II-induced hypertension. Am J Physiol Heart Circ Physiol 300:H555–H564. (2000) Increased brain angiotensin receptor in rats with chronic high-output heart failure. J Card Fail 6:66–72. (2015) Activation of central PPAR-γ attenuates angiotensin II-induced hypertension. Hypertension 66:403–411. (2013) Effects of peroxisome proliferator-activated receptor-β activation in endothelin-dependent hypertension. Cardiovasc Res 99:622–631. (2011) Antihypertensive effects of peroxisome proliferator-activated receptor-β activation in spontaneously hypertensive rats. Hypertension 58:733–743.